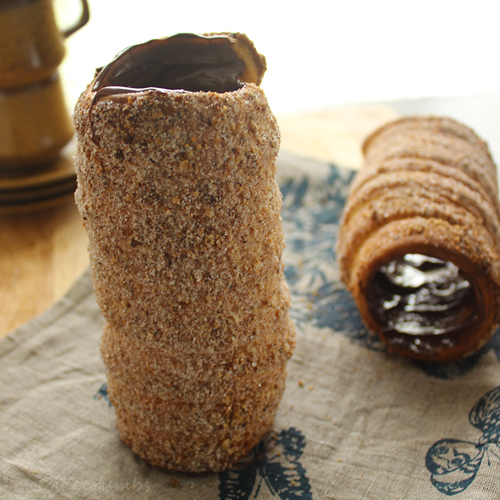 The first cab off the rank were the kürtőskalács, or chimney cakes. I’d never heard of these before, which is my favourite part about Daring Bakers. 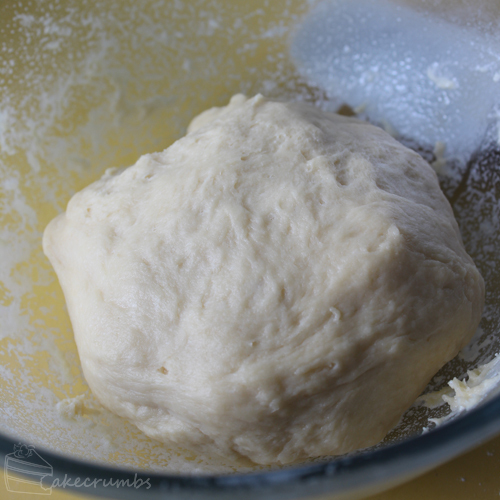 The basics of making a yeast dough, on the other hand, were very familiar. If you’re using dried yeast, like I did, it’s always best to proof it first. You want to make sure it’s still alive so you don’t go wasting all those ingredients. 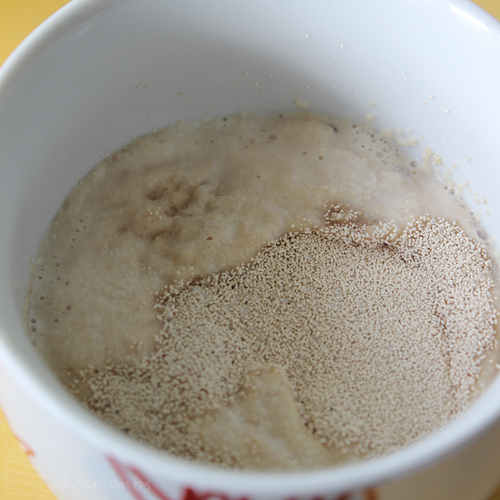 Give the yeast a bath of warm liquid, a little sugar for food and leave it covered for 15 minutes. If it starts to go frothy (and it gives off a lovely bread-y aroma) you’re good to go. The dough is really simple. I mixed all the dry ingredients together in a bowl, made a well in the centre and added all the wet stuff. The dough is relatively sticky so I opted to knead it in the bowl with the spatula at first, then with greased hands after. While it’s proofing you can get everything else set up. These cakes are typically coiled around moulds and cooked over coals on a rotating spit. In the home kitchen, a little improvisation is required. We were provided with a recipe that called for 4 wooden rolling pins. I have two, only one wooden, so I had to bend the rules even further. I covered my one wooden rolling pin in al foil and decided these were going to have to be baked one at a time. 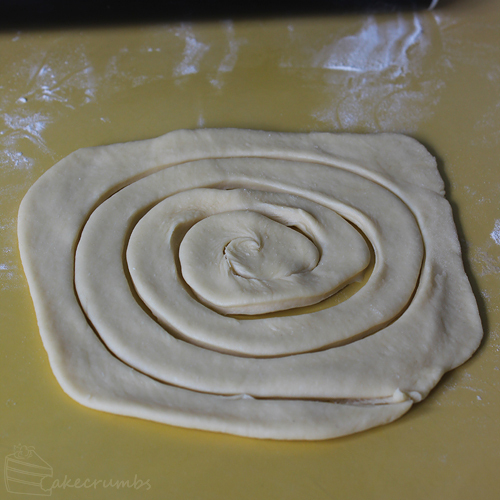 I rolled out a quarter of the dough and used a pizza cutter to cut out a coil shape. 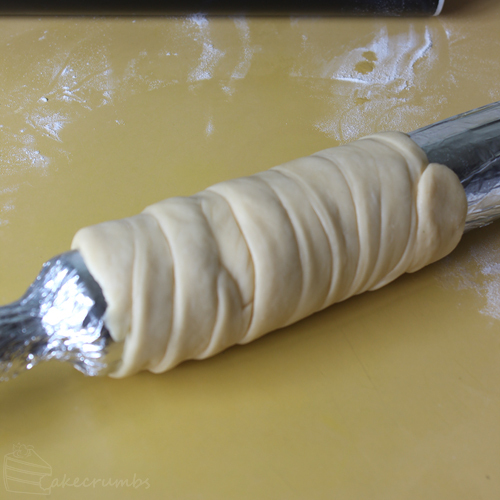 Then the rolling pin is brushed with melted butter so the dough won’t adhere to the al foil. I wrapped the dough around the rolling pin, then rolled it over the bench to flatten it out a bit. Then I brushed it in butter and rolled it in my topping. The original recipe called for walnut sugar, but I was putting my own twist on these babies so I made up a hazelnut sugar mixture instead. Once baked they slid off the rolling pin quite easily. I turned them to sit upright on the cooking rack, and as soon as the rolling pin was removed all the steam started billowing upwards from out of the centre. I’m fairly sure it had nothing to do with the naming of this treat, but it really gave the cake the effect of a smoking chimney. Sadly I couldn’t get it to show up and any of the photos. Once they were cooled I smeared the insides with melted nutella, which is why I decided to pair it with the hazelnut sugar on the outside. I had no idea what to expect from this little treat, but it was amazing. I mean, anything with nutella tends to disappear pretty quickly in this household, but these disappeared especially fast. Our challenge was to make one of the two treats provided, but I couldn’t help but try my hand at both. 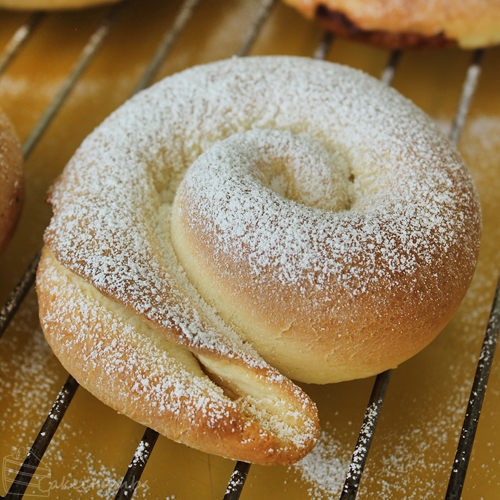 The second recipe was for ensaimadas. I suspect I did something wrong in this one because right from the onset the dough didn’t feel right. They tasted nice enough, but mine seemed too risen, too bread-y. Not what all the other photos looked like. I’m definitely going to have to revisit it and come back with a more successful post. 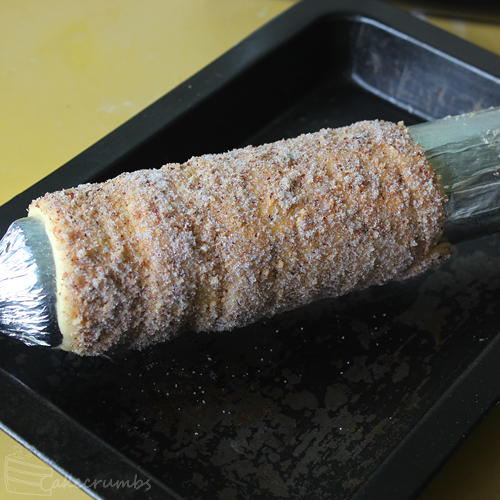 Check out the DB post for the ensaimada recipe. Begin by proofing the yeast; milk should be warmed to the point you can dab a bit on your inner wrist and it won’t feel too warm or burn. Add the yeast and 1 tbsp of the sugar; cover and leave to stand for 15 minutes. Yeast should be frothy and aromatic. Combine the dry ingredients in a large bowl; make a well in the centre. Combine wet ingredients and pour them into the bowl. Gradually work the flour into the centre until it is all combined. 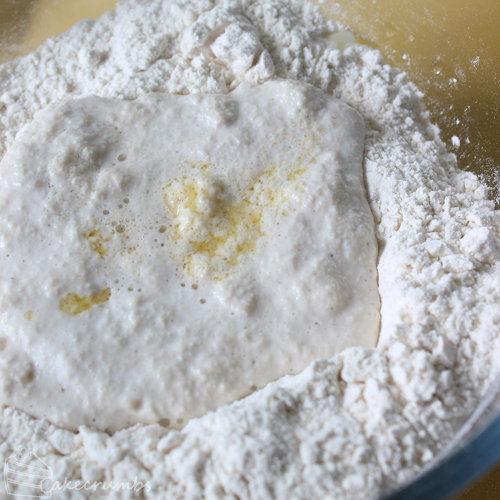 Knead dough for 5 minutes; the dough will be slightly sticky so don’t attempt to add extra flour. Use utensils or greased hands if it is difficult to knead. Transfer dough to a clean, greased bowl; cover and leave in a warm place to rise for an hour or until doubled in volume. 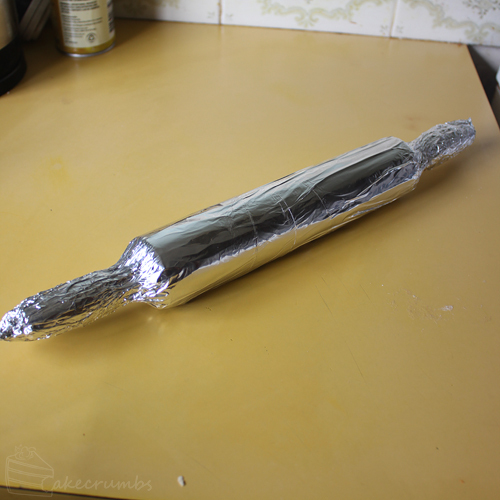 Meanwhile, cover a wooden rolling pin (or more if you have them) in a few layers of aluminium foil. Also find a baking tray that is wide enough to be able to rest the rolling pin on by it handles. Combine hazelnut meal, sugar and cinnamon together on a flat tray. Preheat oven to 180°C (160°C fan-forced/). Punch down dough; divide into quarters. 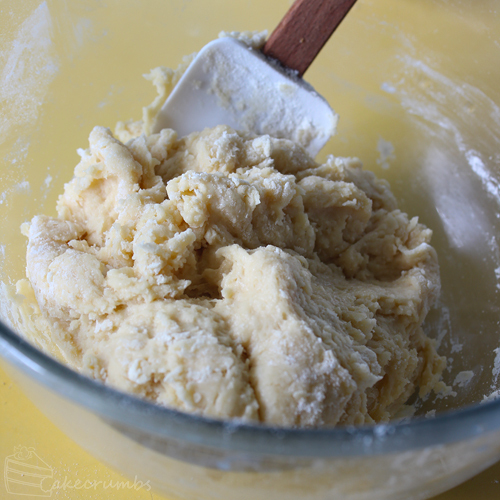 Brush dough with melted butter, then roll in the hazelnut sugar until completely coated. 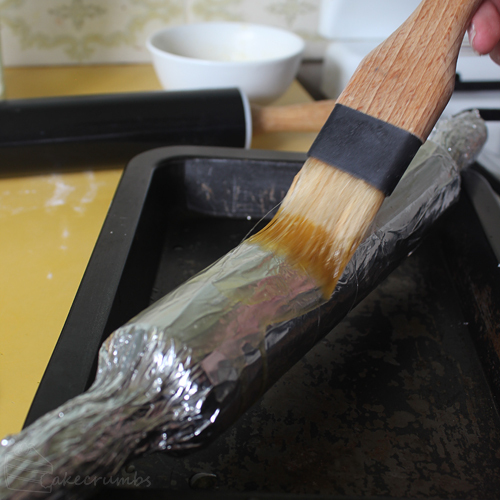 Remove from oven; allow to cool for a minute, then gently slide the cake off of the rolling pin. Allow to cool completely. Melt the nutella either in the microwave or by sitting the jar in simmering water for a moment. Use a knife or spatula to spread an even layer inside the cake. How do you know kürtőskalács??? It really deserves world fame! 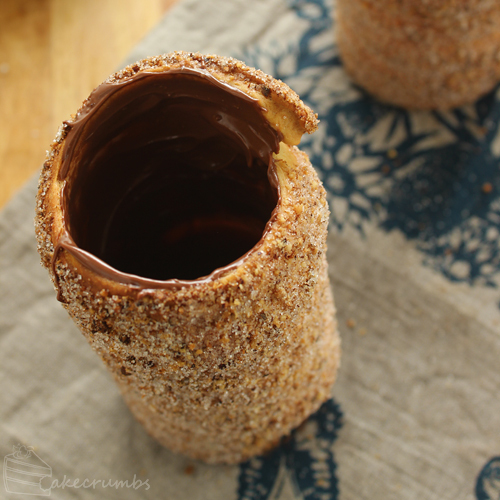 Nutellla filled chimney cake calling my name. Ensaimda looks delicious too. thanks for joining back into daring bakers challenge. 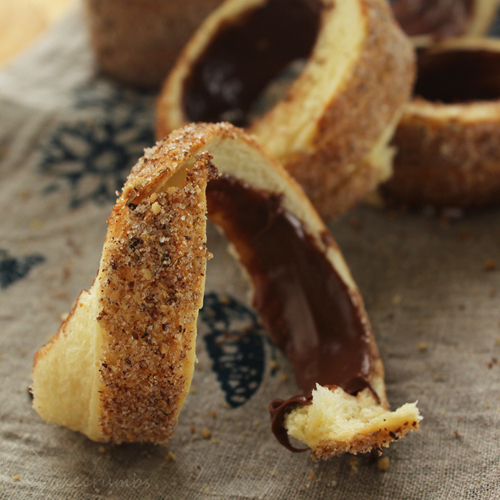 Nutella filled chimney cake looks yum, ensaimda looks perfect too. 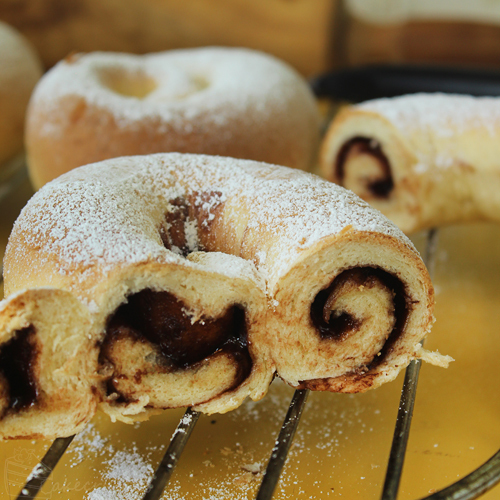 Thanks for joining back on daring bakers challenge. 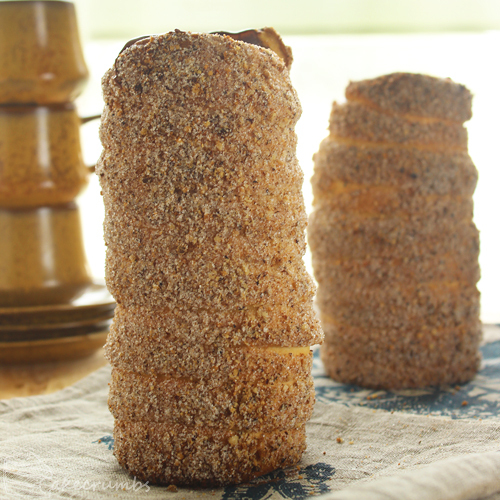 Really beautiful chimney cakes!!! I had trouble with the Ensaimada also, I think there was too much flour on my part. Your photos of both challenges are luscious. Two very impressive looking nommables!